The Pareto Principle or as it's better know, the 80-20 Rule, has been applied to many things. 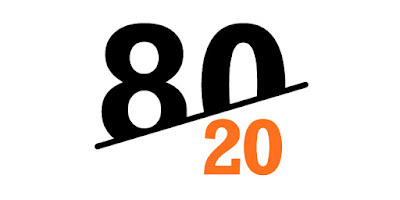 The principle says that 80% of a business's sales come from 20% of their customers and that 80% of revenue is from only 20% of the products offered. The generalized version says 80% of results come from 20% of the causes. Among the things this rule of thumb has been applied to include wealth distribution, spending habits, and even infidelity. Since this principle has such broad applications, I started wondering how this might apply to EV driving and charging. In the How Much Range Is Enough story<<Link TBD>>, we looked at how much range your EV would need. One of the big factors is will the EV be your only car? If so, how easy is it for you to make other arrangements if it will not work for you?... For most people, it is relatively easy to find an EV that will meet 80% of your driving needs. Almost no vehicle meets 100% of a person's transportation needs. So the question is, how much are you willing to pay for something that meets 90, 95, or 99% of your needs. The first similarity is that 80% of a batteries capacity can quickly charge. Whereas the charging rate slows down for the last 20% of the charge. Technically, I don't think this is an application of the Pareto Principle, but it is an 80-20 rule for batteries. On any given day, about 80% of people drive less than 40 miles. For a long-range (200+ mile) EV, forty miles of driving will use about 20% of the capacity. There are multiple uses of the 80-20 rule here. It's less wear and tear on lithium batteries to move energy in and out in the middle 60% of a batteries capacity. This is the reason that long range EVs have a trip mode and a daily driving mode. If the principle holds, 80% of the miles driven and kWh used, will come from the top of this daily drive region of the battery charge range. When you have less than 20% charge left, you might start getting concerned that you could become stranded with a drained battery. This means that 80% of your battery is comfortably usable. Of course, this number is different for every person, but this is a good rule of thumb. The Idaho National Lab studied 125 million miles of EV driving. The study included 6 million charging events. They found that 20% of drivers were responsible for 75% of public charging events. The other 80% of drivers charged primarily at home and rarely if ever used public charging. There are many lessons to be learned from the patterns of charging and battery use. For example, the fact that most charging is done at home could teach us that efforts to pre-wire garages with high amperage 240 Volt outlets would encourage EV ownership better than deploying Level 2 public charging stations. Similarly, deploying charging infrastructure in multi-tenant dwellings may be the best way to allow apartment and condo dwellers to also become plug-in vehicle owners. This is just something that the data hints at and more study would be needed to confirm or reject this, but it seems intuitive that making home charging easy would make EV ownership simpler and more attractive. EV Range: How Much Is Enough?